Verse 1: 'In this gay and festive season, / We must deplore the loss of life, / Human-beings endowed with reason, / Bent on pleasure, not on strife, / Suddenly life is taken away from them, / In a moment they are swept away, / Death has swiftly come upon them, / At the railway bridge on the River Tay.' This ballad was to be sung to an air entitled 'The Battle'. On the night of 28 December 1879, the Tay Railway Bridge collapsed in high winds while a train was crossing it . All seventy-five people on board the train were killed. As is often the case with human tragedies, the event compelled people to write poems and songs as memorials to the victims. 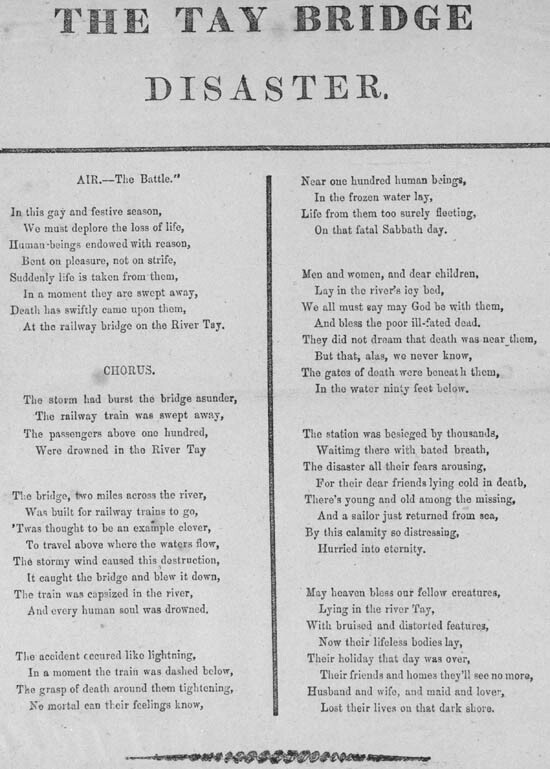 There is more than one poem commemorating the disaster in the National Library of Scotland's collection of broadsides, and the Dundee poet William McGonagall also wrote some famous verses about it.